Prior to their attempt to found a human colony on Mars, the Mars One group plans an unmanned scouting expedition. 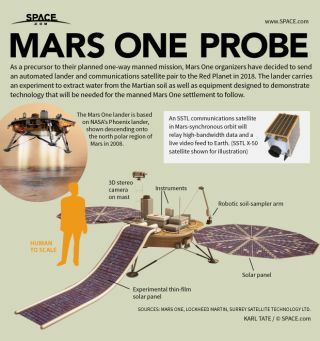 As a precursor to their planned one-way manned mission, Mars One organizers have decided to send an automated lander and communications satellite pair to the Red Planet in 2018. The Mars One lander carries an experiment to extract water from the Martian soil as well as equipment designed to demonstrate technology that will be needed for the manned Mars One settlement to follow. An SSTL communications satellite in Mars-synchronous orbit will relay high-bandwidth data and a live video feed to Earth. The Mars One lander carries two large main solar power panels, an experimental thin-film solar panel, a robotic soil sampler arm, and a 3D stereo camera on a tall mast to provide images taken from the height of a human standing on Mars.